The electrochemical properties of La0.6Sr0.4Co0.2Fe0.8O3-δ-based cathodes are studied as model electrodes for proton ceramic fuel cells. 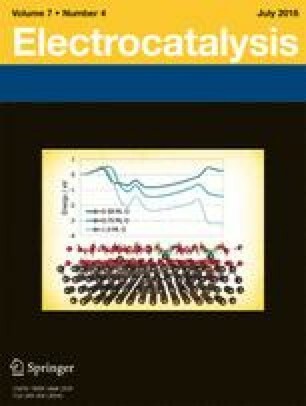 The electrochemical performance of symmetric cells with porous cathodes (La0.6Sr0.4Co0.2Fe0.8O3-δ, La0.6Sr0.4Co0.2Fe0.8O3-δ–BaCe0.9Y0.1O3-δ, and La0.6Sr0.4Co0.2Fe0.8O3-δ–BaZr0.8Y0.2O3-δ), investigated as a function of oxygen and water partial pressures, follows the order La0.6Sr0.4Co0.2Fe0.8O3-δ–BaCe0.9Y0.1O3-δ ≥ La0.6Sr0.4Co0.2Fe0.8O3-δ >> La0.6Sr0.4Co0.2Fe0.8O3-δ–BaZr0.8Y0.2O3-δ. The results indicate that the cathode performance of La0.6Sr0.4Co0.2Fe0.8O3-δ–BaCe0.9Y0.1O3-δ is enhanced mainly due to the extension of the effective triple phase boundary, whereas that of La0.6Sr0.4Co0.2Fe0.8O3-δ–BaZr0.8Y0.2O3-δ is lowered due to the poor proton conductivity along the percolated BaZr0.8Y0.2O3-δ particles. From the observed oxygen partial pressure dependence, the rate-determining step of the above cathode polarization reaction is principally ascribed to the oxygen reduction reaction. This work was conducted under the framework of the Research and Development Program of the Korea Institute of Energy Research (KIER) (B6-2456-01). This research was also supported by the C1 Gas Refinery Program through the National Research Foundation of Korea (NRF) funded by the Ministry of Science, ICT and Future Planning (2015M3D3A1A01064928). Jong Hyun Park (Chungnam National University) and Hyejin Yu (Pukyong National University) are gratefully acknowledged for experimental supports and fruitful discussions.